Mitral stenosis is the medical term for a tight mitral valve. It is a form of structural heart disease. The mitral valve is the valve that sits between the upper chamber (left atrium) and lower chamber (left ventricle) of the left side of the heart, which is considered the main pumping side. The function of the mitral valve is to let blood into the lower chamber of the heart and prevent blood leaking backward (mitral regurgitation) into the top chamber of the heart. If the valve is tight, then it is harder for blood to get from the top to the bottom chamber; this is what happens in mitral stenosis. As the mitral stenosis becomes more and more severe, the blood that cannot get through leads to a back up of blood, and with that comes bad effects on the heart. Severe mitral stenosis can lead to enlargement of the top chamber, increased pressures in lung vessels and congestion with symptoms of heart failure among other problems. Fish mouth sign of severe mitral stenosis. The valve in mitral stenosis is seen to have a small opening only with each time the heart fills with blood, this resembles a fish mouth opening and closing. 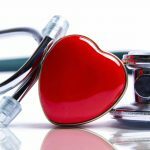 How is Mitral Stenosis Diagnosed? Physical Exam – Initially mitral stenosis may be picked up by physical examination with a stethoscope with a characteristic murmur known as a diastolic rumble. On examination there may also be signs of heart failure, such as swelling and an irregular heart beat known as atrial fibrillation. Echocardiogram – This is an ultrasound scan of the heart and is probably the most important test in diagnosing mitral stenosis. The echocardiogram can characterize many important features of mitral stenosis. The valve itself can be seen, typically not opening well. Measurements can be taken to see what the area of the valve is. Pressure measurement estimates can also be taken with the echocardiogram that can determine the severity of the mitral stenosis. Importantly, the structure of the heart as a whole can be seen which can tell us the effect of the mitral stenosis on the heart. 3D image of the mitral valve demonstrates a restricted valve opening. Transesophageal Echocardiogram – Often, if significant mitral stenosis is suspected a test known as a transesophageal echocardiogram may be performed, where a small ultrasound camera is passed into the food pipe where it can get close to the heart and see structures in great detail. Modern evaluation will typically include a 3D picture also that is considered more accurate. Blood flow through the restricted mitral valve is very turbulent and this is reflected by the harsh mosaic pattern in the image. In general mitral stenosis is graded in stages from A-D, where A is the mildest and D is the most severe. In Stage A patients do not have significant mitral stenosis but they are considered to be at risk. No specific treatment is required and patients should be followed. There should be no symptom and no significant effects on the heart. The mitral valve may appear a little abnormal with some features of early mitral stenosis, but in general the mitral valve works well. In Stage B , the mitral valve area shows clear changes consistent with mitral stenosis but the valve is still not too tight, with the area being 1.5 cm2. The pressures in the right side of the heart are typically normal at this point. There should be no symptoms at this point. In stage C the valve is severely tight, however there are no symptoms. There may be significant enlargement of some of the heart chambers. The valve area is less than 1.5 cm2 and often less than 1 cm2, meaning it is difficult for blood to flow into the main pumping chamber of the heart. The pressures in the right-sided heart chambers are typically elevated. Stage D is where the valve is severely tight and there are symptoms present. The valve is so tight that it causes a backlog of pressure and this results in increased right-sided heart pressures. The valve is typically fused together and blood struggles to drain in to the main pumping chamber of the heart. Fish mouth sign of severe mitral stenosis. Echo imaging studies are important as they can provide important information about the valve that determines the way that mitral stenosis is treated. For example, the echo can provide information on the degree of calcium in the valve and the nature of the narrowing. It can also help to differential rheumatic mitral stenosis from degenerative mitral stenosis. Heart Catherization – This is where small tubes are passed to the heart to gain further information. In patients with severe mitral stenosis, a left heart catheterization is often performed to look at the coronary arteries and rule out blockages. A right heart catheterization is often performed to obtain information about the pressures inside the heart and see the effect of the mitral stenosis. High right-sided heart pressures can be a sign of significant mitral stenosis and the need to intervene on the valve. Patients with mitral stenosis are at increased risk of stroke, particularly if they have an irregular heart rhythm known as atrial fibrillation. This is because they are prone to developing clots in a small area of the heart known as the left atrial appendage. Treatment with blood thinning medication such as Coumadin is typically recommended in patients with mitral stenosis and atrial fibrillation, or those patients with mitral stenosis who have had a history of stroke or mini-strokes. In patients with atrial fibrillation and mitral stenosis, medication used to control the heart rate may be beneficial, such as a beta-blocker. In patients with mitral stenosis and significant symptoms during exercise, medications that control heart rate may be beneficial. In this procedure for severe mitral stenosis a balloon is passed up to the heart and inflated inside the valve to open it up. It is a method of treating mitral stenosis without open-heart surgery, however it is only useful if the valve is determined suitable for this approach. This information can be obtained from the imaging studies. This is an entirely percutaneous and non surgical procedure, like the TAVR procedure for aortic stenosis and the Mitraclip procedure for a leaky mitral valve. In symptomatic patients with severe mitral stenosis who are not suitable for mitral valvuloplasty mitral valve surgery may be required. Typically this is a mitral valve replacement operation instead of mitral valve repair. Mitral valve replacement surgery would also be recommended in patients undergoing heart surgery for other conditions, such as aortic valve replacement due to aortic stenosis. In that case it would make sense to perform both valve replacements in the same operation. Below are a few further samples of images of mitral valve stenosis as seen by echocardiogram.